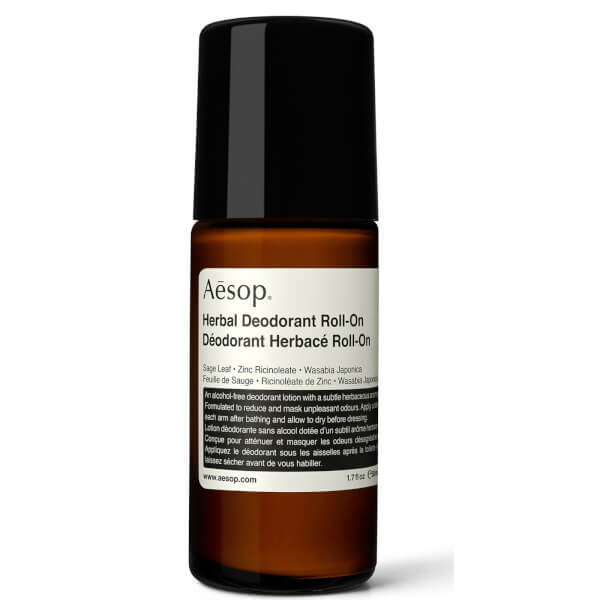 Feel confident around the clock with Aesop Herbal Deodorant Roll-On; an alcohol-free formula that delivers long-lasting protection against wetness, body odours and perspiration. 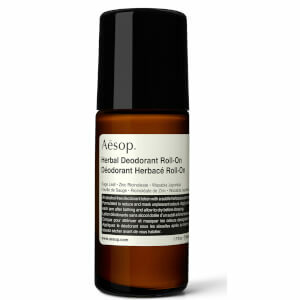 Infused with a host of beneficial ingredients, including Sage Leaf, Zinc Ricinoleate and Wasabi Extract, the roll-on deodorant works to protect your underarms for all day freshness. 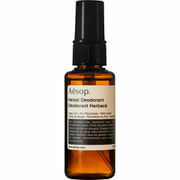 Imparts an invigorating, herbaceous aroma. Roll generously under each arm after bathing and allow to dry before dressing. Water (Aqua), Coco-Caprylate, Glycerin, Ceteareth-20, Zinc Ricinoleate, Sorbitan Stearate, Lavandula Angustifolia (Lavender) Oil, Candelilla/Jojoba/Rice Bran Polyglyceryl-3 Esters, Glyceryl Stearate, Cetearyl Alcohol, Bisabolol, Rosmarinus Officinalis (Rosemary) Leaf Oil, Phenoxyethanol, Microcrystalline Cellulose, Polysorbate 20, Benzyl Alcohol, Sodium Stearoyl Lactylate, Salvia Officinalis (Sage) Oil, Xanthan Gum, Eucalyptus Globulus Leaf Oil, Sodium Gluconate, Ethylhexylglycerin, Wasabia Japonica Root Powder, Cellulose Gum, Citrus Aurantium Dulcis (Orange) Flower Oil, Sodium Benzoate, Zingiber Officinale (Ginger) Root Extract, Lactic Acid, Potassium Sorbate, Tocopherol, Linalool, d-Limonene, Geraniol, Farnesol.